Please don't try to eat this one. Mmm, donuts. This past Friday was National Donut Day in America. Yeah, we missed it too, so don't feel too bad. Since every day is donut day in real life, The Behemoth has decided that BattleBlock Theater is going to let you have a belated snack. And it's calorie-free, too! From now until June 13th, anyone who owns BattleBlock can sign in and watch as a special prisoner named Donut pops out of the vault. Easy! The Behemoth points out that future prisoner unlocks won't be as simple to obtain as ole donut head here, so consider this one a freebie. Don't want to strain yourself in the name of obtaining donuts, do you? BattleBlock Theater supports two player online co-op and four players locally. 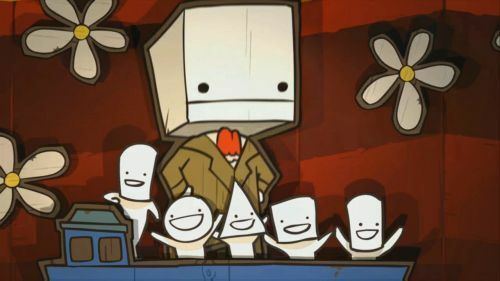 It's also a massively entertaining multiplayer game, as our BattleBlock Theater co-op review suggests.